Contextual Tabs The Ribbon is Microsoft’s solution to the thousands of commands now available in the Office Programs. It’s a combination of the old Menu’s (like File, View and Help) and the old Toolbars (Standard and Formatting toolbars hold the Shortcut Buttons). Microsoft has successfully integrated the 2 systems into 1 logical interface. For years I’ve joked about how Microsoft has always given us 5 ways to do everything. I’ve personally discovered that in Excel 2003 there were 7 ways to copy data. 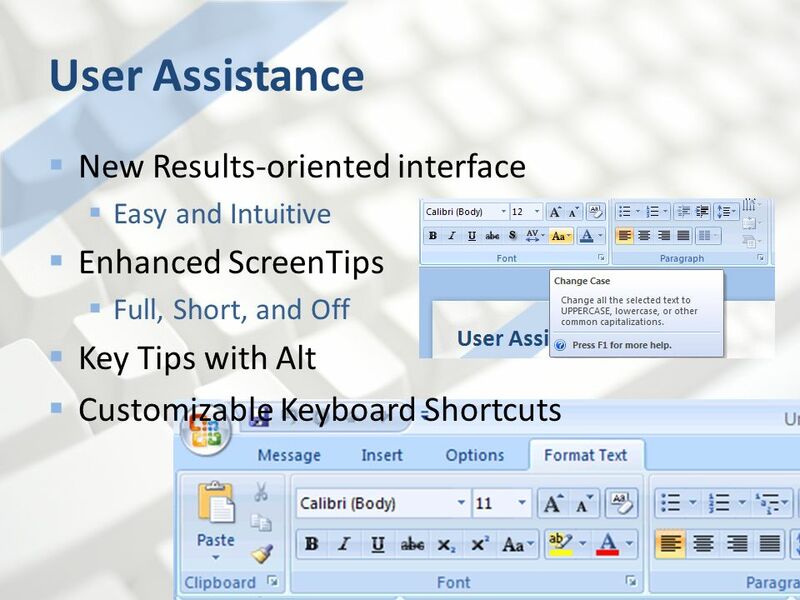 Autofill Handle, Edit Menu, Right Click Menu, Right Click and Drag, CTRL Drag, the Toolbar and of course the standard CTRL + C shortcut. 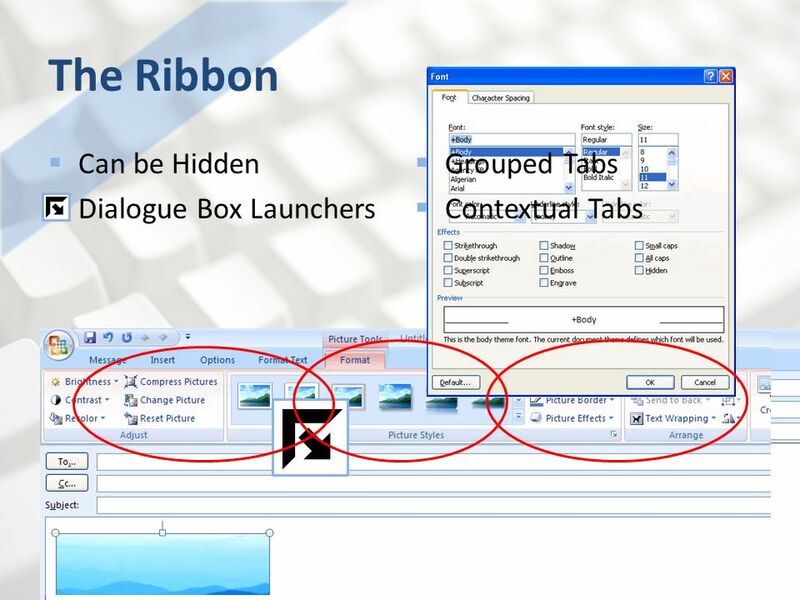 There were too many places hiding things from us in With the new ribbon in 2007, what you need appears when you need it and the features you use more have bigger buttons then less frequent ones. For the last decade I’ve been witnessing the tools getting in the way of the work, not tools getting work out of the way. Users have been not finding what they need and are forced to do convoluted things to access common or repetitive tasks. These problems have been eliminated by the ribbon. This new system really does get the work out of the way. I personally found my workflow increase as I got familiar with the new Office. The Ribbon can be hidden to allow for more screen real estate by double clicking any of it’s Tabs. The Dialogue Box Launchers allow you full control over text and objects. A one stop location to change multiple attributes. For example in the Font Dialogue box you can alter all sorts of text attributes. The Tabs and Buttons are Logically Grouped for efficiency. For the past few years I’ve been advocating a technique I call “Find the Bigger Buttons”. If we aim for bigger buttons we have a greater chance of hitting them. It seems Microsoft had the same line of thought in the design of Office The more frequently used buttons are bigger for easy clicking and the button on each Ribbon Tab have been logically grouped together. Contextual Tabs. Some tabs will only appear when you need them. For instance the picture toolbar conveniently appears anytime you double click a picture and goes away if you click away from the images. Open, Save, Close & Print Program Options Defaults Program settings User Preferences The Office Button This is the new File Menu location. A standard location for Saving, Save as…, Open, Close, Print, Print Preview, and other file and document related activities. It also has a few new features like the compatibility checker which tells you how well the document will save as an older format and what will be lost or converted. The Office Button also contains the information regarding each program’s Options. You can change your overall preferences in the Options area, including the Auto Correct and Spelling Options as well as the Customization features like the new ability to create your own Keyboard Shortcuts. The Options for Office 2003 are located under the Tools Menu. 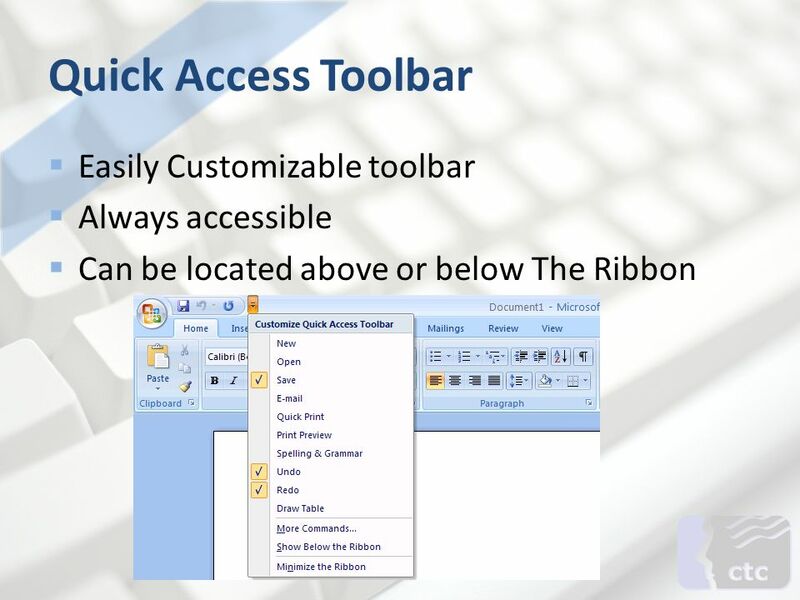 Can be located above or below The Ribbon Quick Access Toolbar The Quick Access Toolbar provides quick access to your favorite tools. You can quickly add or remove buttons to the toolbar that aren’t as readily available as you may want them too in the current interface. 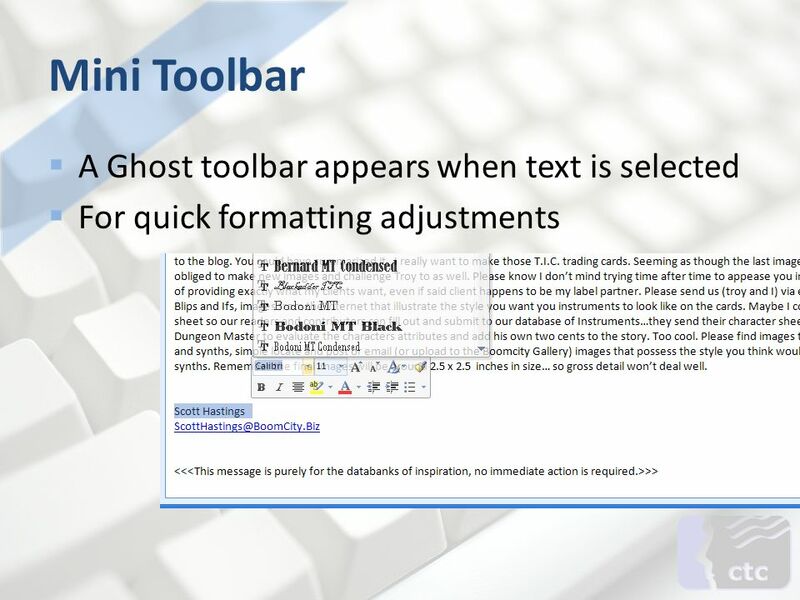 The Quick Access Toolbar is customizable. You can add a button for any feature available within the program there are even a few features that are only available by adding them the toolbar. You can add as many commands to it as needed and it is always accessible regardless of the Ribbon Tab you are on. 35 buttons will fit on the Quick Access Toolbar when it’s located above the Ribbon and 10 more if located below, give or take. Even if all the Buttons are not visually available one can access hidden buttons through a drop down menu on the right of the toolbar. 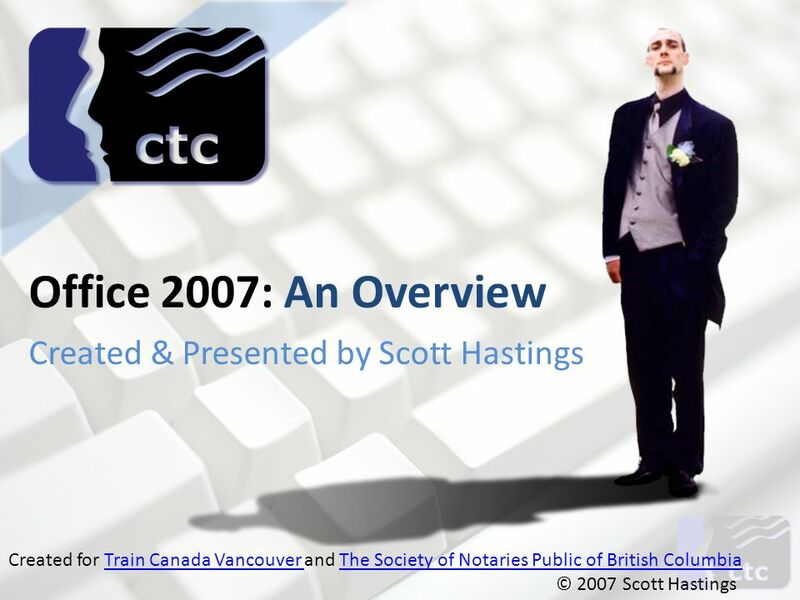 Download ppt "Office 2007: An Overview CTC Train Canada"
Intro to Office 2007 Instructor: Lynn Lee How to make the transition from 2003 to 2007. 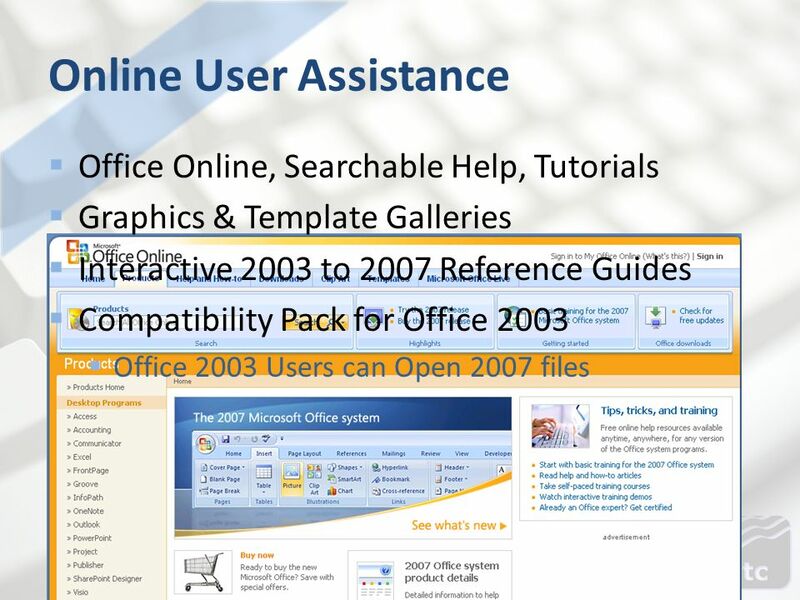 Microsoft Office 2007 Overview Scott A. Dougherty IDEA Training and Consultation Coordinator, Assistive Technology. James Crowley C3 – Crowley Computer Consulting. Quiz What version of Office do you use? What edition? Basic Home and Student. 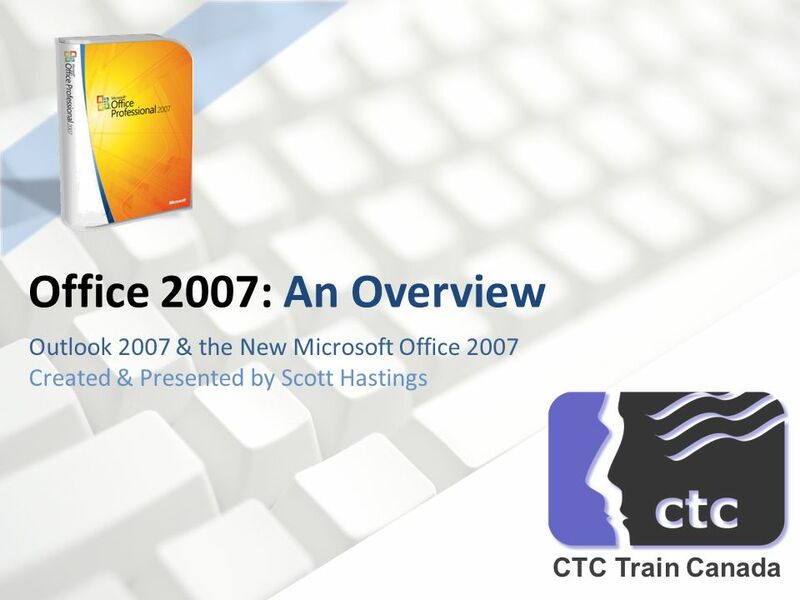 Microsoft ® Office Training Get up to speed with the 2007 system. . Microsoft office Word 2007 is one of the most powerful word processors available today that allows you to create letters, envelopes, memos, fax cover. Office 2007 Major changes We will see! Intuitive ? Tabs and Groups Ribbons not Toolbars Added Features Word Excel PowerPoint Access Outlook. OVERVIEW OF OFFICE 2007 What You Need to Know to Get Started! Copyright © 2010 Pearson Education, Inc. Publishing as Prentice Hall 1 Committed to Shaping the Next Generation of IT Experts. Office Fundamentals Robert. Pasewark & Pasewark 1 Office Lesson 1 Microsoft Office 2007 Basics and the Internet Microsoft Office 2007: Introductory.